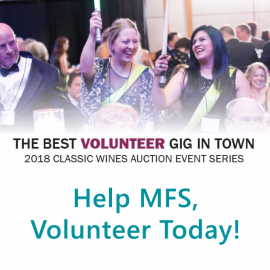 Volunteer for Classic Wines Auction! The Classic Wines Auction is less than 2 months away! Proceeds from their amazing series of events support 5 local nonprofits, including MFS (in fact, we started the Auction 34 years ago!!). Last year, they raised $420,000 for each of the nonprofits, and that wouldn’t have happened without nearly 500 awesome volunteers. Please consider volunteering behind the scenes or on the front lines.There are lots of positions available! See job descriptions here. Double the fun and sign up with a friend before the Jan 15 deadline. Please be sure to indicate that you are affiliated with MFS.